2011 WANDSWORTH GREEN BUSINESS AWARD WINNERS!! 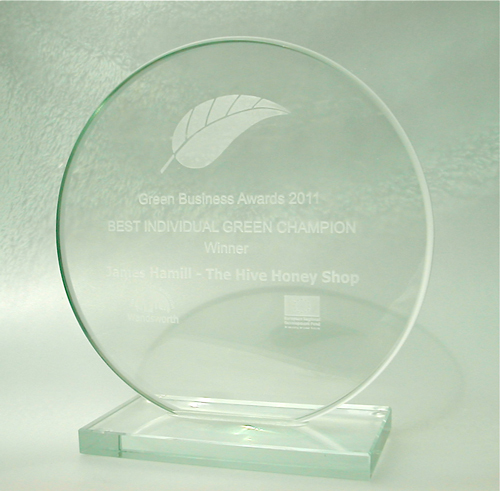 The Hive Honey Shop have WON the 2011 Green Business Awards for ‘Best Individual Green Champion’! Robert of The Hive said; “It was a wonderful surprise to be acknowledged in this way after 20 years of our dedicated environmental business ethos and commitment to bettering waste management and the environment. It was great to be accredited by the panel of Wandsworth Eco Judges“. It was a well organised awards event at the beautiful Wandsworth Civic Suite on September 20th. James from The Hive Honey Shop said: “We brought headband bee antenna to pop on our heads if we won to highlight our commitment to our bees and the environment (also just a bit of lightheartedness). 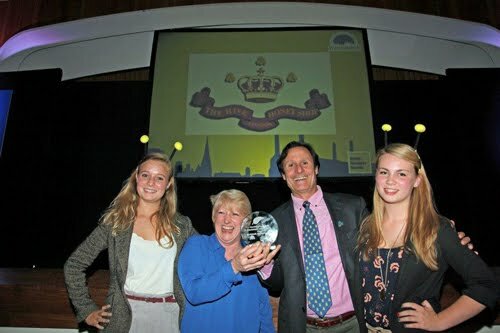 As we walked up on the stage to collect our award, all wearing bee antenna, there was laughing and clapping. As we walked back to our seats people smiled with appreciation and support. It was a wonderfully entertaining night. We will work even harder throughout 2011/2012 to better our shop recycling scheme and I plan to implement a few more eco-friendly waste improvement plans for the shop and farm. We look forward to the next awards ceremony and hope to be nominated again”. Wandsworth Council are to be congratulated for organising this event to highlight and celebrates the eco-efforts of the people who live and work in Wandsworth and the opportunity for businesses to showcase what they have done to reduce their carbon footprint and help the environment.